Al-Aqsa Mosque is an Islamic holy place in the Old City of Jerusalem. The site that includes the mosque (along with the Dome of the Rock), also referred to as al-Haram ash-Sharif or “Sacred Noble Sanctuary”, is the Temple Mount, the holiest site in Judaism, the place where the First and Second Temples are generally accepted to have stood. Muslims believe that Muhammad (PBUH) was transported from the Sacred Mosque in Mecca to al-Aqsa during the Night Journey. Islamic tradition holds that Muhammad (PBUH) led prayers towards this site until the seventeenth month after the emigration, when Allah (SWT) directed him to turn towards the Ka’aba. Sultan Omar Ali Saifuddin Mosque is a royal Islamic mosque located in Bandar Seri Begawan, the capital of the Sultanate of Brunei. The mosque is one of the most spectacular mosques in the Asia Pacific and a major landmark and tourist attraction of Brunei. Named after Omar Ali Saifuddien III, the 28th Sultan of Brunei, the mosque as a symbol of the Islamic faith in Brunei dominates the skyline of Bandar Seri Begawan. The building was completed in 1958 and is an impressive example of modern Islamic architecture. The mosque unites Mughal architecture and Italian styles. The plans were done by Booty and Edwards Chartered Architects according to designs by the Italian architect Cavaliere Rudolfo Nolli, who had already for decades been working at the gulf of Siam. This state mosque is a masterpiece of architecture with its dove-grey walls and glittering majestic domes with gold inlay. It is centrally located at Jalan Tunku Abdul Raman and it is a proof of unique combination of Islamic architecture and contemporary design. Up to 5000 worshippers can be inside at one time; the mosque has become a popular place for visitors from all over the world. During prayer time, even Muslim women can visit the mosque as a special balcony is built that can fit 500 persons. If you are not a Muslim, avoid visiting the mosque on Fridays, as this is the day of prayer for Muslims. Never forget to respect the dress code when you are visiting a place of worship. Near the mosque is also Sabah’s State Mausoleum. The Hassan II Mosque is a religious buildings in Casablanca, Morocco, the largest mosque in the country and the fifth largest mosque in the world after the Masjid al-Haram (Grand Mosque) of Mecca and the Al-Masjid al-Nabawi (Prophet’s Mosque) in Medina. It was designed by the French architect Michel Pinseau and built by Bouygues. It stands on a promontory looking out to the Atlantic, which can be seen through a gigantic glass floor with room for 25,000 worshippers. A further 80,000 can be accommodated in the mosque’s adjoining grounds for a total of 105,000 worshippers present at any given time at the Hassan II mosque. Its minaret is the world’s tallest at 210 m (689 ft). The Faisal Mosque in Islamabad is the largest mosque in Pakistan and South Asia and one of the largest mosques in the world. It was the largest mosque in the world from 1986 until 1993, when it was overtaken in size by the completion of the Hassan II Mosque in Casablanca, Morocco. 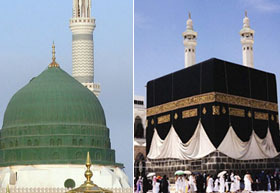 Subsequent expansions of the Masjid al-Haram (Grand Mosque) of Mecca and the Al-Masjid al-Nabawi (Prophet’s Mosque) in Medina, Saudi Arabia during the 1990s relegated Faisal Mosque to fourth place in terms of size. Faisal Mosque is conceived as the National Mosque of Pakistan. It has a covered area of 5,000 m2 (54,000 sq ft). It can accommodate 10,000 worshippers in its main prayer hall, 24,000 in its porticoes, 40,000 in its courtyard, and another 200,000 in its adjoining grounds. Although its covered main prayer hall is smaller than that of the Hassan II Mosque in Casablanca (the world’s third largest mosque), Faisal Mosque has the third largest capacity of accommodating worshippers in its adjoining grounds after the Masjid al-Haram (Grand Mosque) of Mecca, the Al-Masjid al-Nabawi (Prophet’s Mosque) in Medina. Each of the Mosque’s four minarets are 80 m (260 ft) high (the tallest minarets in South Asia) and measure 10 x 10 m in circumference. The Badshahi Mosque or the ‘King’s Mosque’ in Lahore, commissioned by the Mughal Emperor Aurangzeb in 1671 and completed in 1673, is the second largest mosque in Pakistan and South Asia and the fifth largest mosque in the world. Epitomising the beauty, passion and grandeur of the Mughal era, it is Lahore’s most famous landmark and a major tourist attraction. Capable of accommodating 5,000 worshippers in its main prayer hall and a further 95,000 in its courtyard and porticoes, it remained the largest mosque in the world from 1673 to 1986 (a period of 313 years), when overtaken in size by the completion of the Faisal Mosque in Islamabad. Today, it remains the second largest mosque in Pakistan and South Asia and the fifth largest mosque in the world after the Masjid al-Haram (Grand Mosque) of Mecca, the Al-Masjid al-Nabawi (Prophet’s Mosque) in Medina, the Hassan II Mosque in Casablanca and the Faisal Mosque in Islamabad. Petra (“rock”) is an ancient city and archaeological site in Jordan carved in cliffs of multicolored rocks. It was built roughly 2,000 years ago by an ancient Arab people, the Nabateans, at a site that was a center for trade routes carrying silk from China and spices and precious stones from India to the West. It fell into disuse when the Romans captured the area and changed the trade route. Since then, earthquakes and erosion have changed the landscape, making it even more stunning. Today, Petra is a national symbol for Jordan and its most visited tourist attraction. Located merely eleven miles north of Beirut, the Jeita Grotto is a site to behold. The compound has two separate but connected limestone caves that span nearly ten kilometers in length, making it the longest cave complex in the Middle East. The lower cave can only be visited by boat, since it sits on an underground river that is a principal source of water for Lebanese citizens. The caves were formed through the dissolution of limestone over millions of years and were first discovered in 1836 by Reverend William Thompson. Exploration into the depths of the caves is still taking place. Today, Jeita Grotto serves as a national symbol and major tourist destination for Lebanon. The Giza Necropolis is located on the outskirts of Cairo and includes the Great Pyramids and the famous sculpture, the Sphinx. The only Ancient Wonder of the World that remains standing, these pyramids have long been considered one of the most precious sites in the world. The Great Pyramid, the largest of the three pyramids pictured, was built over 4,500 years ago and was the world’s tallest building for an astounding 3,000 years. It remains a building of architectural wonder given the complexity and precision found in its design. The pyramids were built as tombs for ancient rulers of Egypt, who were considered to be immortal in the eyes of their followers; today, they are one of Egypt’s main tourist attractions. The Dead Sea is one of the most captivating and unique bodies of water in the world. The sea is most known for its incredibly high salinity levels; the water here is one third salt, making it eight times saltier than ocean-water. The high level of salinity makes it nearly impossible for animals to live here, hence the name “Dead” Sea. It is also very difficult to swim in these waters. The Dead Sea is the deepest hypersaline lake in the world (378 meters deep) and has the lowest elevation on dry land on the Earth’s surface (422 meters below sea level). The body of water also has historical significance and has been utilized for its massive reserves of salt. Built in the sixth century, the Hagia Sophia has a long and storied history. Originally a church, the Hagia Sofia was converted into a mosque after the Ottoman Turks conquered Constantinople (Istanbul) in 1453, whereupon the structure was renamed Ayasofya. Ayasofya’s towering dome has been used as a model for mosques for hundreds of years and is said to have changed modern architecture for its size and beauty. The interior of the building is filled with breath-taking pillars, mosaics and archways. Today, the building is a museum for members of all faiths to appreciate. Undisturbed by humans, Bu Tinah islands is a natural treasure lying off the coast of Abu Dhabi in the United Arab Emirates. The small archipelago is the region’s largest UNESCO marine biosphere reserve for its thriving ecosystem. The island is entirely closed off from humans and is patrolled to ensure that no one attempts to disrupt the habitat. The island is home to numerous endangered species and serves as a crucial research site for determining the effects of global warming. The island is also surrounded by an extensive coral reef, which survives the harsh temperatures and high salinity levels of the region. Located in the West African nation of Mali, Timbuktu once lay at the crossroads of four major trade routes that supplied the Arab world. Its geographic position made the city one of the wealthiest in the world during the 12th century. The city is home one of the first universities in the world, Koranic Sankore University, a celebrated Islamic university that taught over 20,000 students. Over time, Timbuktu developed into the intellectual and spiritual capital of Islam in Africa, and served as a focal point for regional expansion of the religion. While many of its buildings face the threat of desertification, Timbuktu remains an historically important location for intellectual scholarship in Islam. The Burj Al Arab is a luxury hotel located in Dubai, United Arab Emirates. At 321 m (1,053 ft), it is the second tallest hotel in the world. The Burj Al Arab stands on an artificial island 280 m (920 ft) out from Jumeirah beach, and is connected to the mainland by a private curving bridge. It is an iconic structure whose shape mimics the sail of a ship. The beachfront area where the Burj Al Arab and Jumeirah Beach Hotel are located was previously called Chicago Beach. The hotel is located on an island of reclaimed land 280 meters offshore of the beach of the former Chicago Beach Hotel. The locale’s name had its origins in the Chicago Bridge & Iron Company which at one time welded giant floating oil storage tankers on the site.